Ken Boyer is the NL MVP!!! 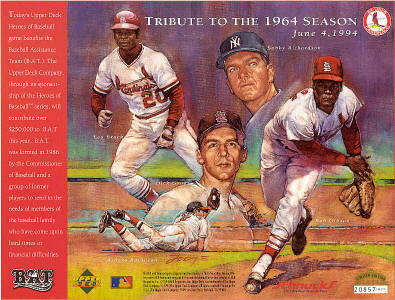 Bob Gibson is the WS MVP!!! 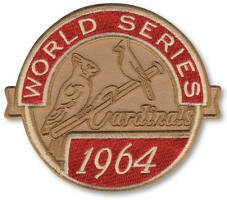 In 1964 the Cards were 5 games out of 1st place on September 23rd. Then they reeled off 8 straight wins, including 3 against the Phillies, to claim the NL pennant by one game over the Phillies and the Reds. On September 13th, during a 15-2 blowout at Wrigley Field, the Cards become the first team to score in every inning in more than 40 years. It had last been done on June 1st, 1923, by the Giants. Ray Sadecki posted his only 20-win season (20-11) in his 18 big-league career! Tim McCarver blasts a game winning tenth inning three run home at Yankee Stadium in game 5 of the WS. 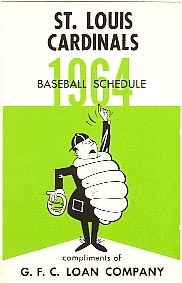 Barney Schultz saved 14 games from Aug 1st on to help rally to the NL pennant. In the World Series, Bob Gibson struck out 31 Yankees batters... The rest of the Cardinals pitching staff combined for 23 strike outs. 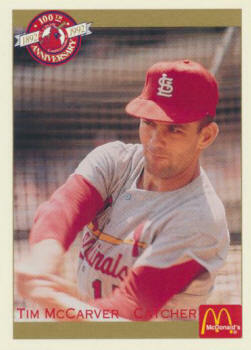 Tim McCarver led the team with a .478 batting average in the World Series.